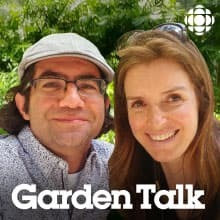 From pruning, to pest control, to balcony gardening, Here and Now host Gill Deacon and Toronto Botanical Garden horticulture director Paul Zammit help solve your gardening problems every week throughout the warm months. In the final episode of Garden Talk's first season, Gill and Paul take questions about protecting plants over winter, apple tree blossoms, protecting plants from caterpillars, getting a head start on next spring and more. Questions about bringing plants indoors for the fall, tomatoes, magnolias, clematis and more. Questions about getting young students gardening, hydrangeas that just won't bloom, overgrown lilacs, transplanting sweet grass and more. Questions about growing in a condo, brown tips on ferns, white film on zucchini plants and more. Questions about Vimy Oaks, watering, lilacs, tomatoes, seeding grass and tips for late planters. Questions about milkweed, blueberries, low sunlight, Swiss chard and more... plus a piece of the origin story of Paul Zammit is uncovered. Gill Deacon and Paul Zammit take gardening questions about watering trees, lavender, raspberries and more. Gill Deacon and Paul Zammit take gardening questions about sumach, spider mites, rose clippings, hydrangeas, Japanese Maples and more. Gill Deacon and Paul Zammit take gardening questions about potato beetles, Japanese knotweed, container gardening, raccoons, tomato rot and more.